Enjoy the World's Greatest Sand Dunes - Here on Lake Michigan! Our beaches are the best in the Midwest...in the Nation...in the world! Well, at least we think so, and so does ABC's Good Morning America. The Sleeping Bear Dunes National Lakeshore in Northern Michigan was voted by the viewers of GMA as the most beautiful place in America. 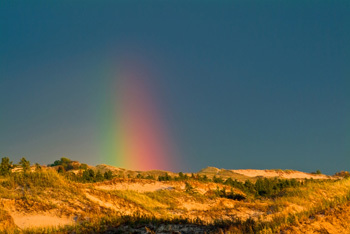 One of the spectacular sights at Sleeping Bear is the sand dunes that peak at over 400 feet. The largest dune system in the world associated with a freshwater lake is right here in Michigan! You have to go back to when glaciers covered Michigan to find the original source for the sand. The deposits left behind were mostly made of quartz, and over time the constant movement of the water formed what is now our sugar sand. 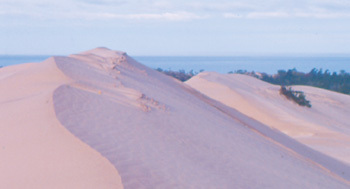 In order for sand dunes to develop, you must have a large source of dry sand, the winds to transport it, and an area large enough for the dune to take hold. The eastern coast of Lake Michigan has a vast array of impressive sand dunes, thanks to the westerly winds that take the sand and blow it into dune formations. Often these dunes become covered with vegetation, which stabilizes them. If this vegetation is gone, the dunes experience wind erosion. or choose to view the dunes and lakeshore in a guided tour. Fulgurites are often found in the sand and it's a fun activity to search for them! The combination of Lake Michigan, Silver Lake, quaint beach shops, Little Sable Point Lighthouse and the fantastic dunes make the Silver Lake Sand Dunes a top destination in Michigan. Even Hamlin Lake, just north of Ludington, has sand dunes that people love to visit...by boat or by car! Located on the northwest section of the lake, you can climb the dune (which is within the Ludington State Park) and see Lake Michigan on the other side. Many take their boats or jet skis and anchor them on the beach at the base of the dune. On the southwest side of Hamlin Lake in the State Park you can climb Mt. Baldy and experience terrific views of Lake Michigan. Be sure to visit Big Sable Point Lighthouse while you're exploring the Ludington State Park. With the Lake Michigan Recreation Area to the north and the Ludington State Park to the south, Nordhouse Dunes Wilderness has a total of 3,450 acres within the Manistee National Forest. Here there are no roads, but two parking areas just outside the Wilderness...at the Lake Michigan Recreation Area in the northern section, or Nurnberg Road at the southeastern corner. From there you can hike through forests, dunes, and along the Lake Michigan shoreline. Camping sites are also available in the Recreation Area. It truly is a magnificent spot here in Michigan, and now the secret is out! Located in northwest Michigan within Benzie and Leelanau counties, Sleeping Bear Dunes National Lakeshore has the most impressive dunes in the state. Along the seven mile Pierce Stocking Scenic Drive, stop at the observation deck, 450 feet above lake level and take in the sights. Straight down is Lake Michigan and one mile north is Sleeping Bear Dune. A Visitors Center, trails, and picnic areas make this a must-see attraction for nature enthusiasts. Arcadia Dunes is spread across 3,600 acres, located roughly halfway between Frankfort and Manistee. Also known as the C.S. Mott Nature Preserve, there are 15 miles for hiking and biking, north and west of M-22. Enjoy spectacular views from two miles of Lake Michigan shoreline. Neighboring working farms which encompass an area of 2,500 acres have been protected, making Arcadia Dunes one of the largest conservation projects in the Midwest. Bikers find Dry Hills Trail the place to go, as this 10 mile loop is one of the best off-road rides in Northern Michigan. The best views come from up on Old Baldy Trail, a 3.7 mile trek on the west side of M-22. Further down the coast of Lake Michigan just south of Holland is the Saugatuck Dunes State Park. This 1,120 acre park has 14 miles of hiking trails through beautiful wooded sand dunes. There is also 2.5 miles of Lake Michigan beachfront. Within a 300-acre natural area are fresh water coastal dunes that tower over 200 feet. The Saugatuck Dunes State Park is very popular among nature enthusiasts, bird watchers and hikers. Located between Benton Harbor and New Buffalo, Michigan, Warren Dunes is set on 1,952 acres. It features six miles of hiking trails and three miles of shoreline. It has a dune formation that rises 260 feet above the lake with expansive Lake Michigan views. Established in 1925, this state park is spread out over 2,180 acres and lies in the northern part of Porter County, known as the "Front Porch of the Dunes." Three miles of clean Lake Michgan beach await you, often rated in the top 10 family beaches in the country. Find the beach at Central Avenue, where you can access the nearby Calumet Bike Trail, a 9.1 mile gravel trail that winds through woodlands and marshes. Ambitious visitors are urged to climb the large sand dunes, some which tower nearly 200 feet. The park has camping, picnicking, and over 70 miles of trails for hiking. If you're a nature lover, the Indiana Dunes State Park has various species of birds, as well as marshy habitats where you'll discover black oak savanna and wild lupine. The western coast of Lake Michigan on the Wisconsin side tends to be more rocky than Michigan's coastline, but there are a few places where you'll find sand dunes. 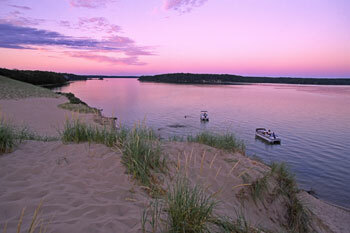 Whitefish Dunes State Park, located in Sturgeon Bay has the highest sand dunes in the state. 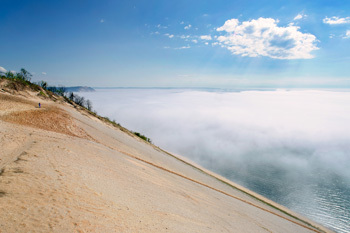 The tallest dune, "Old Baldy," is 93 feet above lake level. Visitors are urged to use the wooden boardwalks to reach the top, and to stay on the marked trails while hiking in the dune area. Kohler-Andrae State Park is located in Sheboygan, Wisconsin and stretches over 1,000 acres. Here you can walk the 2.5 mile Dunes Cordwalk trails through the dunes, then stop at one of the three overlooks that offer a view of Lake Michigan. Point Beach State Park is just north of Two Rivers and features six miles of shoreline. Here the tall dunes obscure views of the lake from the camping sites. Between Manitowoc and Two Rivers is the Wooded Dunes Nature Center with over seven miles of trails. This is a wildlife haven with marshlands, meadows and swamps. Michigan's lakes, forests, beaches, and sand dunes form a combination that can't be replicated in any other state. It's simply Pure Michigan!